This article is about fugitive slaves. For the 2012 film, see Runaway Slave (film). The phenomenon of slaves running away and seeking to gain freedom is as old as the institution of slavery itself. 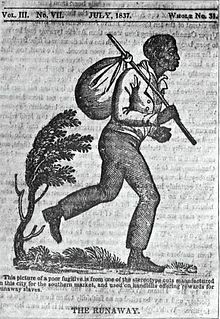 In the history of slavery in the United States, "fugitive slaves" (also known as runaway slaves) were slaves who left their master and traveled without authorization; generally they tried to reach states or territories where slavery was banned, including Canada, or, until 1821, Spanish Florida. Most slave law tried to control slave travel by requiring them to carry official passes if traveling without a master. Passage of the Fugitive Slave Act of 1850 increased penalties against fugitive slaves and people who aided them. Because of this, fugitive slaves tried to leave the United States altogether, traveling to Canada or Mexico. During the time slavery was legal in the United States, approximately 100,000 slaves escaped to freedom. Prior to the establishment of the United States, and extending until Florida became a territory of the United States in 1821, the destination of many fugitive slaves was Spanish Florida. In a policy formalized in 1693, Spain offered escaped British slaves safe refuge and freedom, provided they converted to Catholicism and served a period in the militia. The first free settlement of former slaves in the Americas was Santa Teresa de Mose, near St. Augustine, Florida. This community disbanded when Florida became a British possession in 1763, most of the slaves withdrawing to Cuba with the Spanish troops defending the San Marcos fort in St. Augustine. Florida became a Spanish colony again in 1783, and it again became a fugitive slave destination. Heavy U.S. pressure caused Spain to rescind its formal welcoming of slaves, but it had little effect. Runaway slaves from as far as Virginia and Tennessee continued to emigrate to Florida, and the Spaniards, whose control over the territory was weak, had neither the means nor the inclination to capture and return them — in fact, they invited the slave owners to catch them themselves. A larger colony of maroons (fugitive slaves) grew up at Prospect Bluff, on the Apalachicola River in remote northwest Florida, in the final years of the eighteenth century. Trading posts were set up, first at San Marcos de Apalache and then at Prospect Bluff. These were run by British firms; since the U.S. independence in 1783 Britain had begun itself welcoming fugitive U.S. slaves, to the point of creating a military unit of them, the Corps of Colonial Marines. The colony at Prospect Bluff continued until General Andrew Jackson built Fort Gadsden there in 1818, using it as a base for the First Seminole War. In fact, eliminating the refuge in Florida for fugitive slaves was the primary motive for the War, and for the United States' acquisition of Florida. After that date, fugitive slaves would head north. The United States Constitution, ratified in 1788, never uses the words "slave" or "slavery", but recognized its existence in the so-called fugitive slave clause (Article IV, Section 2, Clause 3), the three-fifths clause, and the prohibition on prohibiting importation, for 20 years, of "such Persons as any of the States now existing shall think proper to admit" (Article I, Section 9). The Fugitive Slave Act of 1793 required citizens to aid in the return of escaped slaves to their owners. In practice, both citizens and governments of free states often supported the escape of fugitive slaves. Fugitive slaves early in U.S. were sought out just as they were through the Fugitive slave law years, but early efforts included only Wanted posters, flyers etc. The Fugitive Slave Act of 1850 strengthened provisions for the recapture of slaves, and offered them no protection in the justice system. Bounty hunters and civilians could lawfully capture escaped slaves in the North, or any other place, using little more than an affidavit, and return them to the Slave master. Many escaped slaves upon return were to face harsh punishments such as amputation of limbs, whippings, branding, and many other horrible acts. Individuals who aided fugitive slaves were charged and punished under this law. In the case of Ableman v. Booth, Booth was charged with aiding Glover's escape in Wisconsin by preventing his capture by Federal Marshals. The Wisconsin Supreme Court ruled that the Fugitive Slave Act of 1850 was unconstitutional for requiring states to go against their own laws in protecting slavery. Ableman v. Booth was appealed by the federal government to the US Supreme Court, which upheld the constitutionality of the Act. Many states tried to nullify the new slave act or prevent capture of escaped slaves by setting up new laws to protect their rights. One of the most notable is the Massachusetts Liberty Act. This Act was passed in order to keep escaped slaves from being returned to their masters through abduction by Federal Marshals or bounty hunters. The Underground Railroad had developed as a way in which free blacks and whites (and sometimes slaves) aided fugitive slaves to reach freedom in northern states or Canada. "Stations" were set up in private homes, churches, caves, barns, and hidden places, to give escaped slaves places to stay on their way. People who maintained the stations provided food, clothing, shelter, and guidance to the fugitives. This is one of the most well-known ways that abolitionists aided slaves out of the South and into northern states. When the slaves were found missing, masters did everything they could to find the runaways. Flyers would be put up, posses to find him/her would be sent out, and under the new Fugitive Slave Act they could now send federal marshals into the north to extract them. This new law also brought bounty hunters into the business of returning slaves to their masters; a former slave could be brought back into the South to be sold back into slavery, if he/she was without freedom papers. In 1851 there was a case of a black coffeehouse waiter who was snatched by federal marshals on behalf of John Debree, who claimed the man to be his property. Even though the man had escaped earlier, his case was brought before the Massachusetts supreme court to be tried. The consequences of the Fugitive Slave Act of 1850, the Northern outrage at the acts, or for them crimes, that the act authorized are generally considered one of the causes of the American Civil War. Fugitive slave Gordon during his 1863 medical examination in a Union camp. The Underground Railroad was a network of black and white abolitionists between 1645 and the end of the Civil War who helped fugitive slaves escape to freedom. Members of the Religious Society of Friends (Quakers), Baptists, Methodists and other religious sects helped in operating the Underground Railroad. The Underground Railroad was initially an escape route that would assist fugitive enslaved African Americans in arriving in the Northern states; however, the passage of the Fugitive Slave Act of 1850, as well as other laws aiding the Southern states in the capturing of runaway slaves, resulted in the Underground Railroad being used as a mechanism to reach Canada. Canada was a safe haven for African-American slaves because Canada had already abolished slavery by 1783. Blacks in Canada were also provided equal protection under the law. The well-known Underground Railroad "conductor" Harriet Tubman is said to have led approximately 300 slaves to Canada. The Fugitive Slave Act of 1850, part of the Compromise of 1850, was a law enacted by the Congress that declared that all fugitive slaves should be returned to their masters. Because the South agreed to have California enter as a free state, the Fugitive Slave Act of 1850 was created. The act was passed on September 18, 1850, and it was repealed on June 28, 1864. The act strengthened the authority of the federal government in the capturing of fugitive slaves. The act authorized federal marshals to require Northern citizen bystanders to aid in the capturing of runaways. Many Northerners perceived the legislation as a way in which the federal government overstepped its authority, due to the fact that the legislation could be used to force Northerners to act against their abolitionist beliefs. Many Northern states eventually passed "personal liberty laws", which prevented the kidnapping of alleged runaway slaves; however, in the court case known as Prigg v. Pennsylvania, the personal liberty laws were ruled unconstitutional on the grounds that the capturing of fugitive slaves was a federal matter in which states did not have the power to interfere. One of the most notable fugitive slaves of American history and conductors of the Underground Railroad is Harriet Tubman. Born into slavery in Dorchester County, Maryland around 1822, Tubman as a young adult escaped from her master's plantation in 1849. Between 1850 and 1860, she returned to the South numerous times to help parties of other slaves to freedom, guiding them through the lands she knew well. She aided an estimated 300 persons to escape from slavery, including her parents. During this time, there were numerous bounties on her head throughout the South, payable to anyone who could capture her and bring her back to slavery. Many people called her the "Moses of her people." During the American Civil War, Harriet Tubman also worked as a spy and as a nurse at Port Royal, South Carolina. Wikimedia Commons has media related to Fugitive slaves. ^ Renford, Reese (2011). "Canada; The Promised Land for Slaves". Western Journal of Black Studies. 35 (3): 208–217. ^ Mitchell, Mary Niall; et al. (2019-02-20). "Rediscovering the lives of the enslaved people who freed themselves". Washington Post. Retrieved 2019-02-20. ^ Reese, Renford (2011). "Canada; The Promised Land for Slaves". Western Journal of Black Studies. ^ White, Deborah (2013). Freedom on my Mind. Boston Mass: Bedford/St Martins. p. 286. ISBN 9780312648831. Baker, H. Robert, "The Fugitive Slave Clause and the Antebellum Constitution," Law and History Review 30 (Nov. 2012), 1133–74.